room to grow: Welcome Here! For some strange reason, ever since I did an entryway Room To Go, I've been really excited and anxious to tackle our own entryway. The space is limited. Very limited. The improvements that we added reside behind the door, due to that lack of space. Here's a brief breakdown of the few simple improvement that we added to our entryway that make our lives more organized! 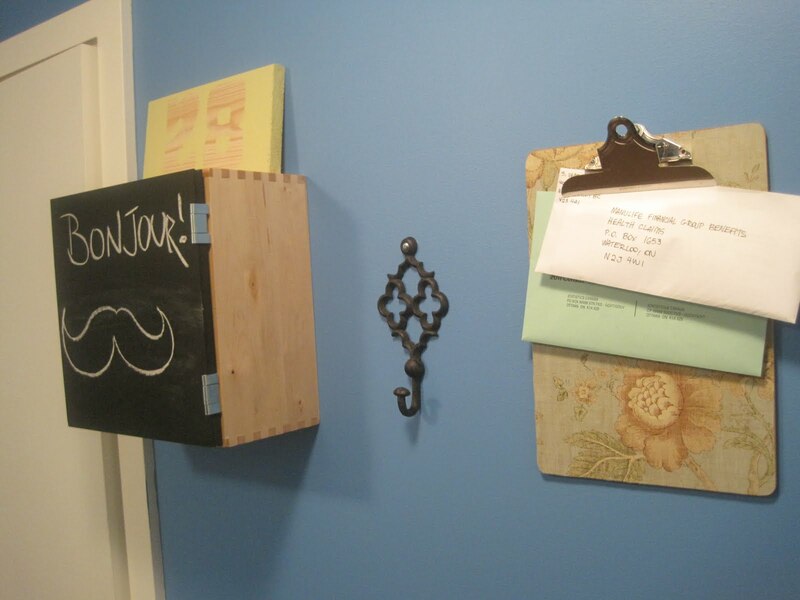 First of all, this is a cabinet with a chalkboard door that we purchased from IKEA almost 3 years ago!...it's been sitting in storage ever since, and we finally got around to hanging it. I suppose that you can never have too many chalkboards in a room. 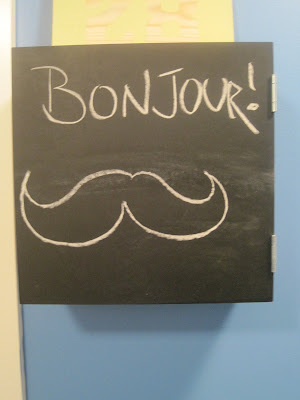 The french greeting is courtesy of Jackie, and the lopsided mustache was done by myself. We found this vintage looking hook at a home decor store in town called "Cozy Home". The hook was only 6 bucks, and will become the new residence for Jackie's purses. This mail station was composed by myself last week. It is comprised of a clipboard ($2 at Walmart) and an old scrap of vintage-looking wallpaper (free! yay Home Depot!). 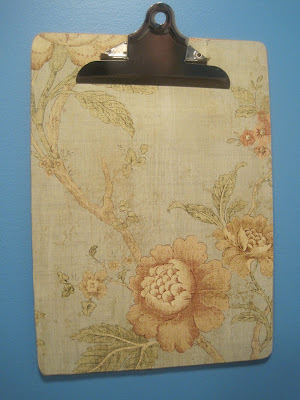 It was easy enough to do- I just traced the size of the clipboard onto the wallpaper, cut it out, lathered the clipboard with Modge Podge, and carefully positioned the paper. The tricky part was to cover around the metal clip near the top of the board. After throwing a few ideas out there, I cut out a similar shade, and ended up covering a bit of the clip- but it's barely noticable. 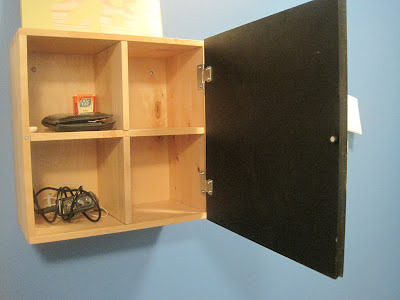 I find that mail can quickly pile up- so keeping it in a visible spot (that looks good too) will keep clutter at bay. "why do you always pick the most difficult projects to do?" 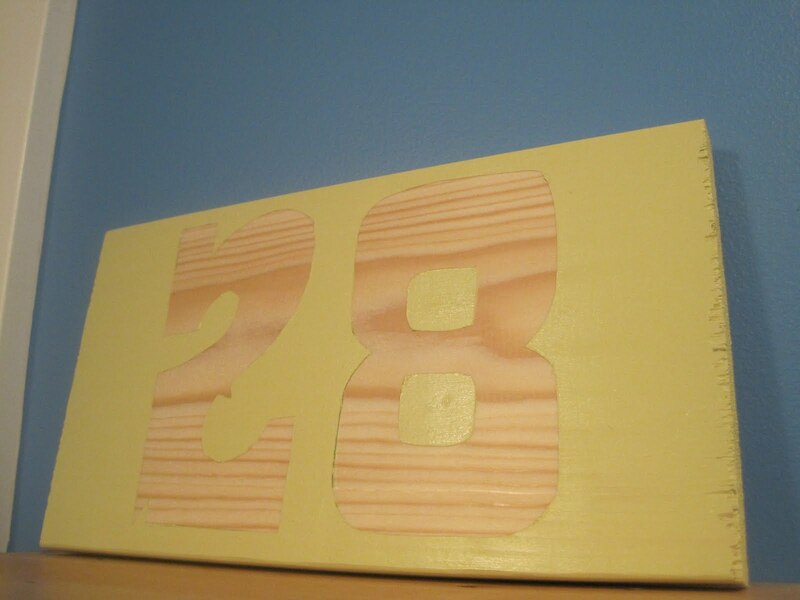 ﻿ and finally, the wooden plaque with a 28 on it. This piece of wood serves absolutely no purpose other than to look good. I am always a fan of the numerology look, but have never really had a number I wanted to boast. But this 28 is loaded with sentiment and meaning. 28 is the day of our anniversary in December. 28 is also Hazel's birthday in March. -the atomic mass of silicon and nickel. -28 days is the revolution of the sun's surface. -the number of dominoes in a standard set. -corresponds to the word koakh, meaning "power", "energy". 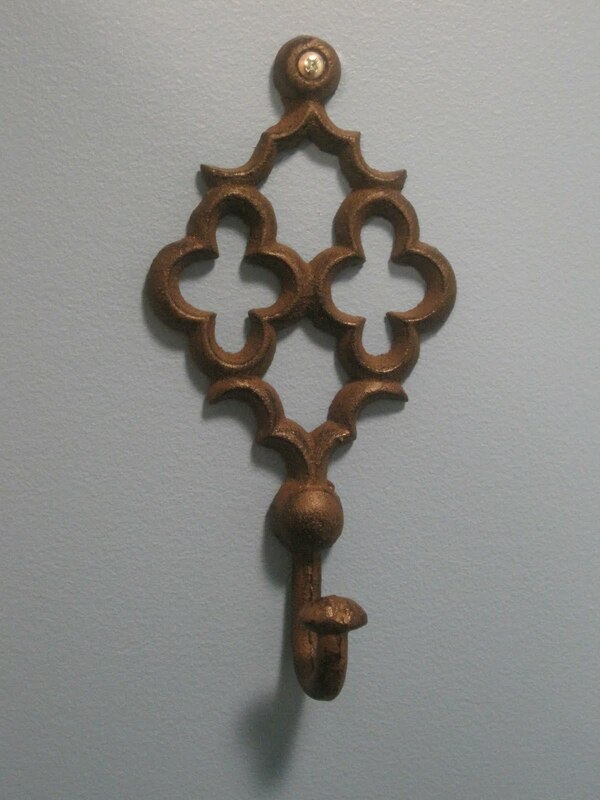 -deals with the expectancy of divine courage and strength. I did this project by getting a 10" by 5" block of wood cut at work. I then covered the entire piece in Frog Tape. True, I previously griped about its lack of worth, but I had some leftover, so I figured I'd give it a second shot. I then drew the letters on top of the masked wood. 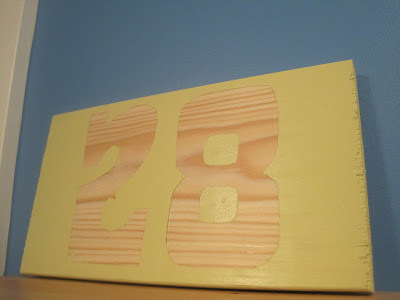 Using an exacto knife, I cut around the numbers and removed the surrounding tape to reveal a numbered stencil. Using some high gloss Pale Avocado paint (the same one used for our dresser makeover), I lathered on a quick coat, and removed the tape, and was done! This was a quick little project to do- less than an hour!- and I love how the wood grain comes through.